Pay-Off - Swellable Tape | Tensor Machinery Ltd. 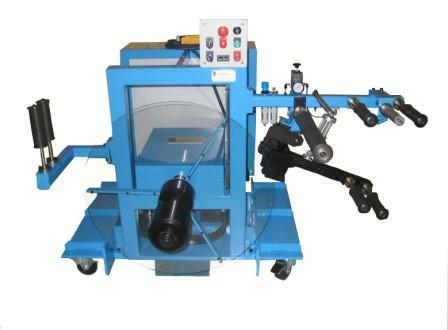 This pay-off has an extended shaft in order to handle both single wide packages and large traverse tape packages. Expanding chucks grip the inner core of the swellable package. The shaft is driven with an AC Vector motor. 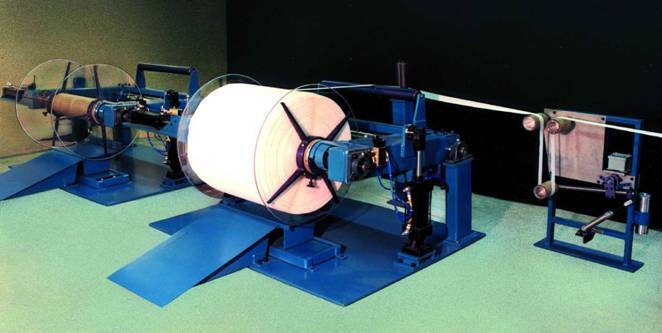 A tear-off roller extends the width of the tape pad and a series of rollers directs the tape to the dancer. For a stand-alone tape pay-off, the tape tension is achieved by a double roller dancer system mounted on the pay-off. The dancer controls the pay-off speed and the tape tension. 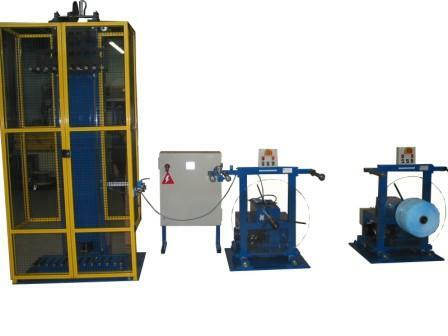 The tension is pneumatically controlled with an air cylinder. This pay-off is specifically designed for the larger traverse pads. The pad is rolled between the cantilever arms where two pintles engage the cardboard core. One pintle is driven by an AC Vector motor. The cantilever arms raise the pad off the floor. The tape is then directed to a dancer arm assembly, which controls the speed of the pay-off as well as the tape tension. 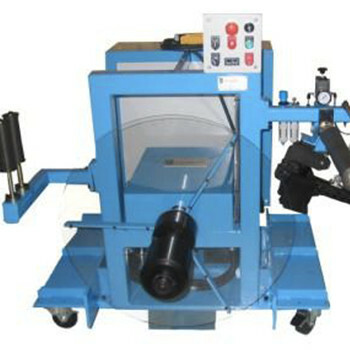 For a continuous run, it is sometimes desirable to accumulate the tape while a tape splice is being performed from one package to the next. Two pay-offs are placed in tandem and both are controlled by a single tape accumulator/dancer. While one pay-off is running, the tape travels from the pay-off, through the accumulator and to the tape former. When a splice is required, the operator stops the running pay-off and the accumulator gives off its tape under a controlled tension. When the splice is complete, the operator pushes the button and the new tape pad starts to run at a speed that allows the accumulator to refill. Once the accumulator reaches a preset distance from the top, it changes and acts as a dancer control for the selected pay-off. A small PLC is used to control the pay-offs, alarms and accumulator.